Once I started looking for dogs to photograph, I noticed all sorts of dog related places and signs. The Dog Bakery is in Cape Coral. 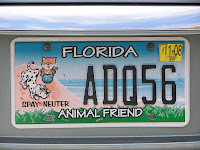 Florida has lots of designer license plates but this one caught my eye! 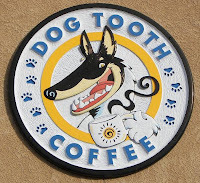 This coffee house is in Colorado Springs - along the bike path that we occasionally ride. They have outdoor seating and on a nice day, you will see customers drinking their coffee with their dogs at their side. I always sit inside.